While the country Saudi Arabia may invoke memories of genies and princes in the Disney film “Aladdin,” it is also the home country of Fares Alrahji, a sophomore computer science major at USF. Fares was born in northern Saudi Arabia, where he said there are more foreigners, which makes the area a bit different from the other conservative, deeply religious areas of Saudi Arabia. Saudia Arabia is an Arab country whose culture is in many ways defined by the dominant religion of Islam. For example, drinking alcohol is prohibited because it conflicts with an Islamic dietary law. Comparing Saudi Arabia and the United States, Fares said, “The cultures are really different, Saudi Arabia is very conservative. It’s becoming more liberal.” In 2005, Fares moved to London to attend St. Giles International, a school for international students who are learning to speak English. Fares said it took him approximately one year to learn the language. Shortly after, he moved to Michigan, which was “really cold” for him, since Saudi Arabia enjoys hot weather and a landscape of deserts. Fares originally wanted to live in France, but decided to come to America instead. He said, “ I like the American lifestyle.” He especially likes California and its weather. He said his friends and family back in Saudi Arabia think that all of the United States is like California. Fares said that although college is free in Saudi Arabia, there are not that many schools. In addition, Fares said that the schools there are not as advanced in science and technology as are colleges in the United States. However, the new king, Abdullah bin Abdul Aziz, is “giving away scholarships to 30,000 students,” said Fares. He said that the complimentary education is good, but that education is better here in the United States. 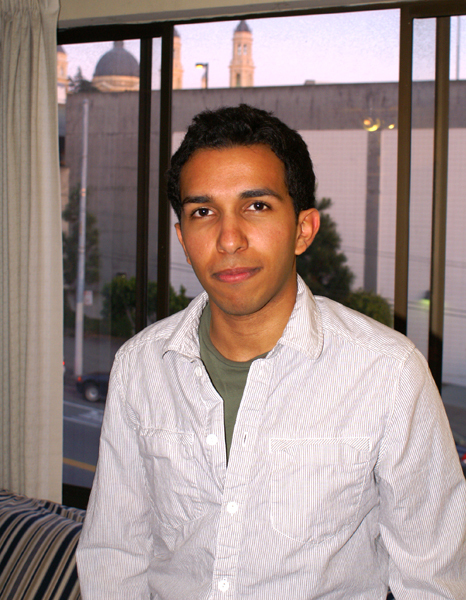 Fares attended Chabot College in Hayward, California for one year. He considered transferring to another university like San Francisco State University or California State University at Hayward (East Bay), but when he saw the USF campus, he “really liked it.” After college, Fares said, “I would like to have the experience of working in the United States.” He plans to stay in San Francisco for two to three years and then move back to Saudi Arabia. When he is not studying, Fares can be found “walking around downtown,” because he “[likes] the crowds.” He said “Hayward is really quiet,” so he enjoys the noise and sounds of a busy city. Fares, you rock! Great piece!